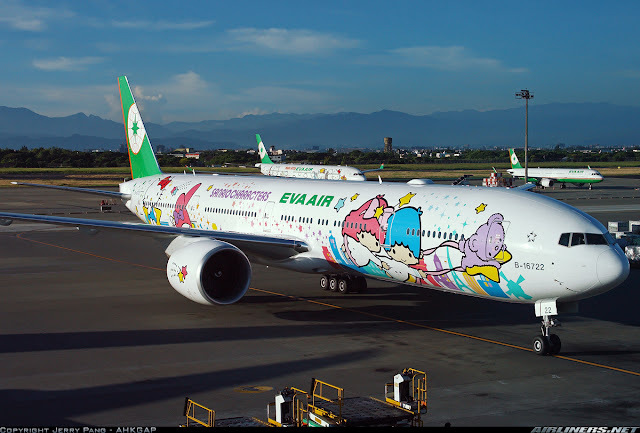 Welcome to my biography on EVA Air's B-16722 aircraft! 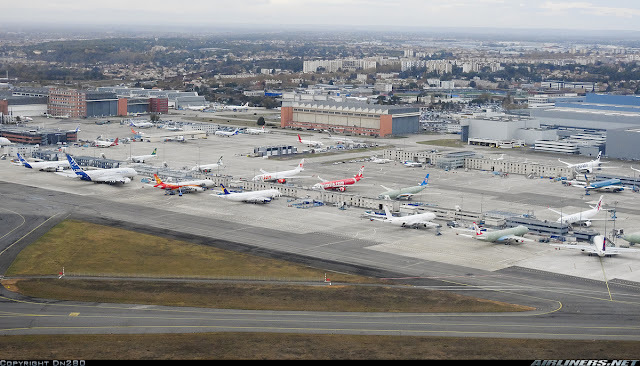 This post is credited to Airbus, Boeing and to a few friends for being very helpful by providing some essential information that makes this blog post possible. Thank you! EVA Air has been a long time Boeing customer and according to staff from the management, the company loves the Boeing 777 very much and has ordered 2 more Boeing 777-300ER recently and will take the current number of 23 to 36 in a few years time. 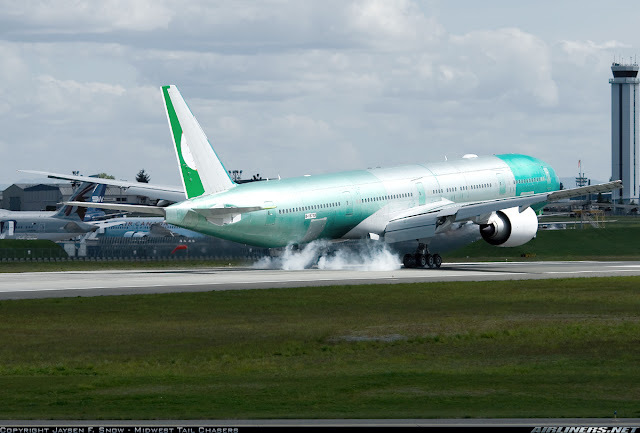 As for the cargo division, it has ordered 5 Boeing 777-200F (Freighter) to replace the Boeing 747-400F. 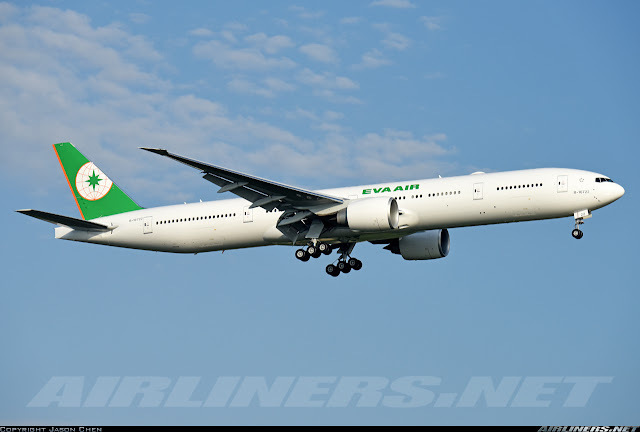 This airline is expected to order the Boeing 777-8/-9 model in the near future and I can't see the carrier ordering Airbus A350 for several reasons: 1: Engine choice (Roll Royce is the sole operator for A350 and EVA Air has a long term relationship with General Electric) 2: Preference for Boeing's wide-body 3. Boeing 787/777 combo is the preferred choice for the airline. The airline has recently introduced a new corporate livery and photos can be found below. 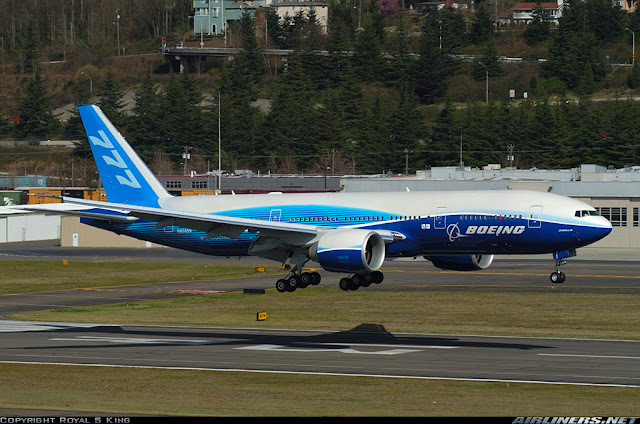 Boeing launched the Boeing 777-300ER in February 2000 when major airlines were looking for an aircraft to replace the Airbus A340-200/-300 and Boeing 747. Airbus introduced the A340-500/-600 but Boeing came out with a better aircraft, the Boeing 777-200LR, and -300ER. Orders for this aircraft were overwhelming and even now (17 years later), it is still gaining orders. 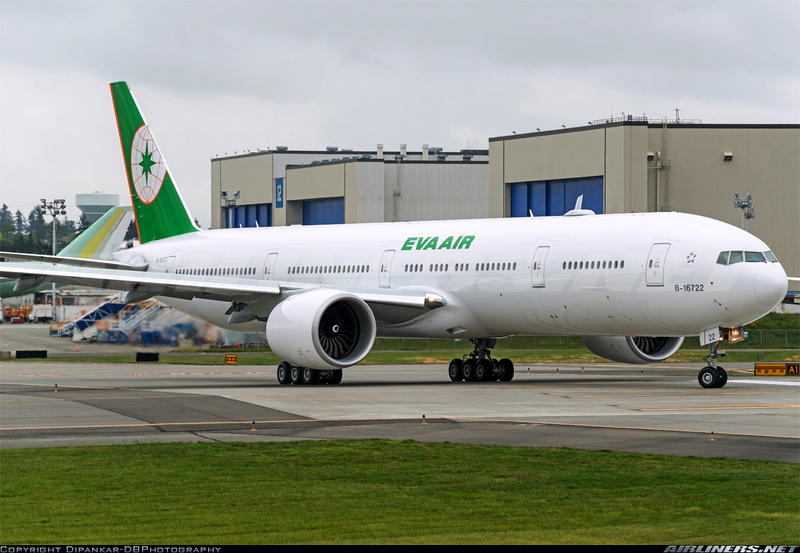 EVA Air is one of the launch customers and placed an order for 4 Boeing 777-300ER and 3 Boeing 777-200LR with an option for 8 in 2000. Later on, the airline changed its order by converting the 3 Boeing 777-200LRs to Boeing 777-300ER models and converted the option of 8 aircraft into firm orders, bringing the total number to 15 Boeing 777-300ER aircraft for the first batch. 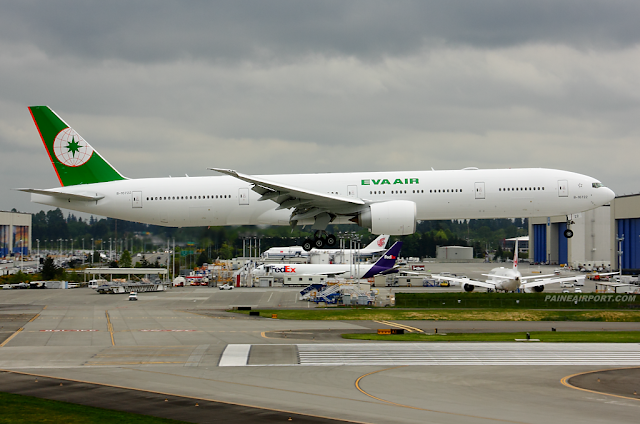 The Boeing 777-300ER was to replace the Boeing 747-400 as some of them would be converted into a freighter and later on more Boeing 777-300ERs were ordered for fleet expansion as the market continues to grow with new routes being introduced. During the expansion period, the airline joined Star Alliance to enhance the reputation and upgrades to the inflight products were made. 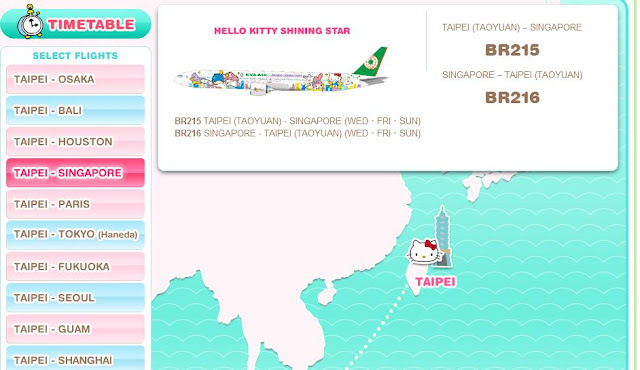 The Hello Kitty craze joined the airline when Sanrio and EVA Air signed a contract to promote the "mouthless" kitty! 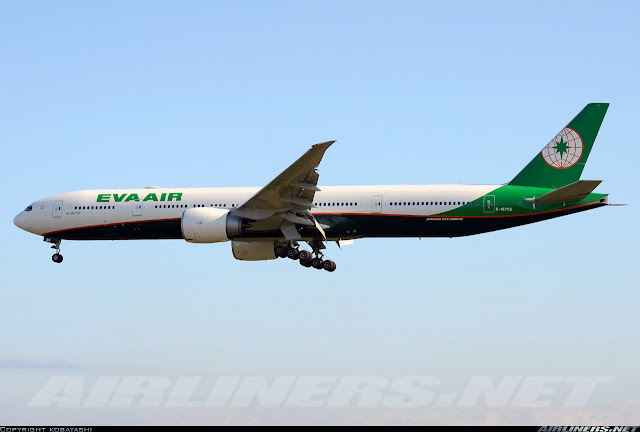 The reason why EVA Air replaced this type with 777-300ER because initially, the airline thought that -300ER would struggle on the longest route in the network. 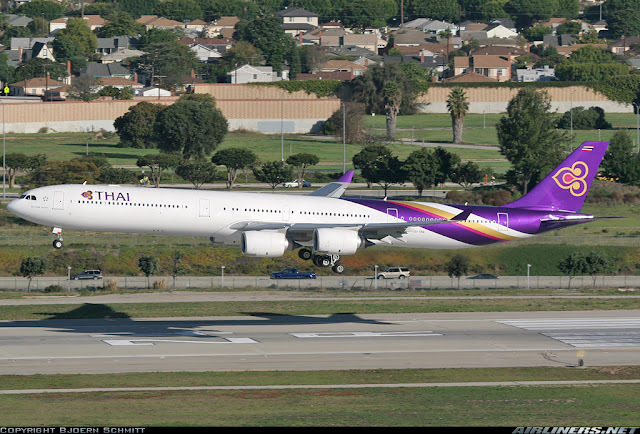 Since Boeing had proven to the airline it was able to those long routes without payload penalty, the switch was made. 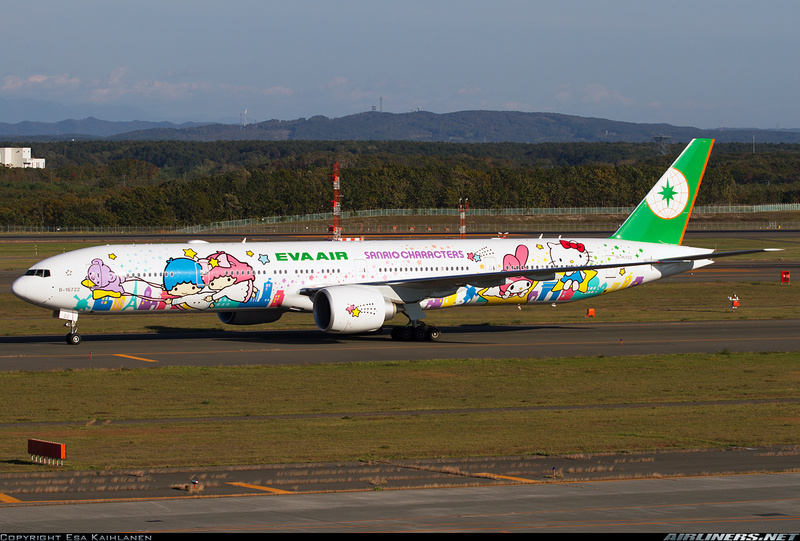 It was more economical to operate the -300ER for the airline. This is Boeing's Dreamliner livery, it was used for flight tests and later on Biman Bangladesh took over this aircraft. 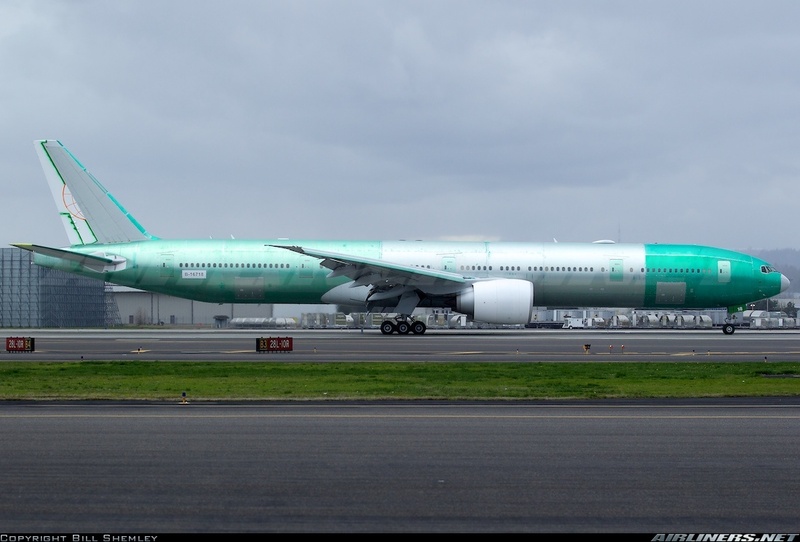 Airbus and Boeing are the major aircraft manufacturers and the only ones that most airlines would buy the aircraft from especially for the wide-body aircraft (2 aisles in the cabin). First of all, airlines are ambitious, they want to have a good share of the local market and with the right aircraft, give their rivals a good run of their money. One of the issues would be replacing the old and less efficient aircraft or ordering more aircraft for fleet expansion. When that time comes especially with the aircraft manufacturers launch a new aircraft type, the airline would study the proposal from the manufacturers and with other carriers, a formal discussion would be done with the interested airlines and once its launch, these interested airlines would place an order, making them the launch customers for the new aircraft type. Launch customers usually get a good discount as the early models tend to be overweight or have issues which the aircraft manufacturer would solve during the initial months of the new aircraft's performance. Some airlines prefer to order the aircraft sometime later to operate the improved version of the aircraft. So it all depends on the airline and their needs! For existing aircraft types, the decision to order which model would take a quicker time. The management would decide on the numbers and the top rank staff in the company would study the proposal and give the green light if they are satisfied with it. Back to the airline management: Before the airline makes a decision on the aircraft type/types and how many they want to order, the financial side would do the calculations to ensure the operation of the airline continues to work without worrying about cash flow - that's the primary issue of all airlines. The market can be uncertain at times like SARS period and other major issues that may cause the airline to ground flights so all these issues must be taken into account, making sure the airline has back up money and plan just in case things goes wrong. Airlines can choose either to lease (from leasing companies) or purchase directly from the manufacturer, it all depends on the spending power of the airlines. 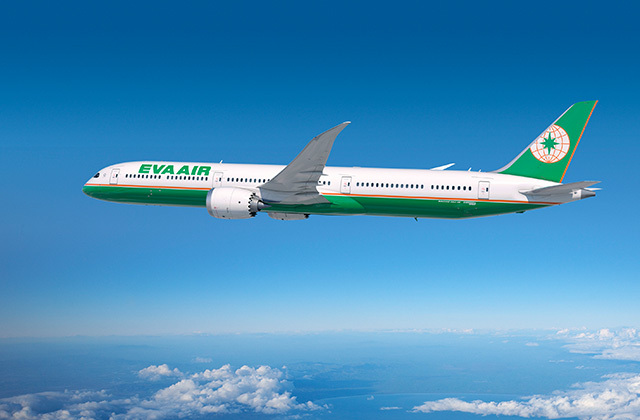 For EVA Air, it has taken up the option of purchasing a few and leasing the rest as it feels it works better for the airline. Different airlines = different strategy. Some prefer to purchase them and operate them until they are not cost effective to operate them anymore. 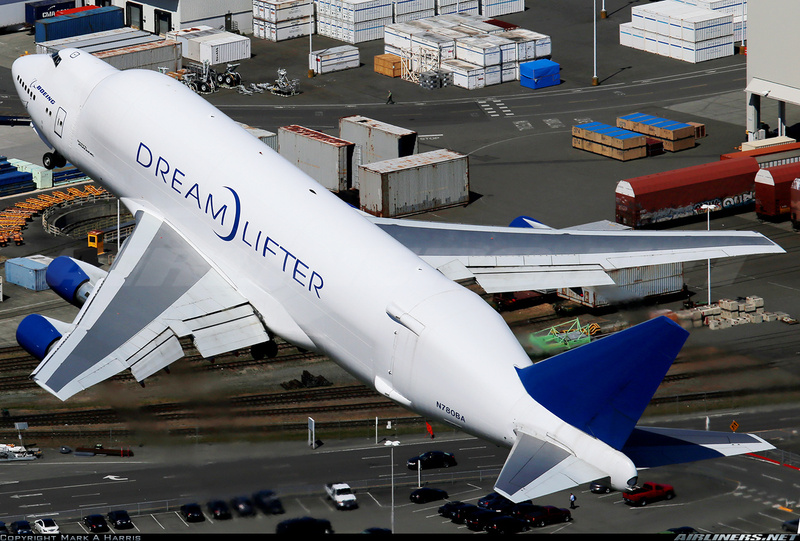 Boeing Dreamlifter is built to carry parts of the aircraft (mostly 787's aircraft parts), but I was told it can carry other aircraft types (Boeing) when necessary. For longtime customers of the aircraft manufacturer, they usually get a discount especially buying in bulk. Loyalty discount may also be given to airlines that have been buying aircraft from them only. This loyalty discount may be lost if the airline orders aircraft from a competing rival. 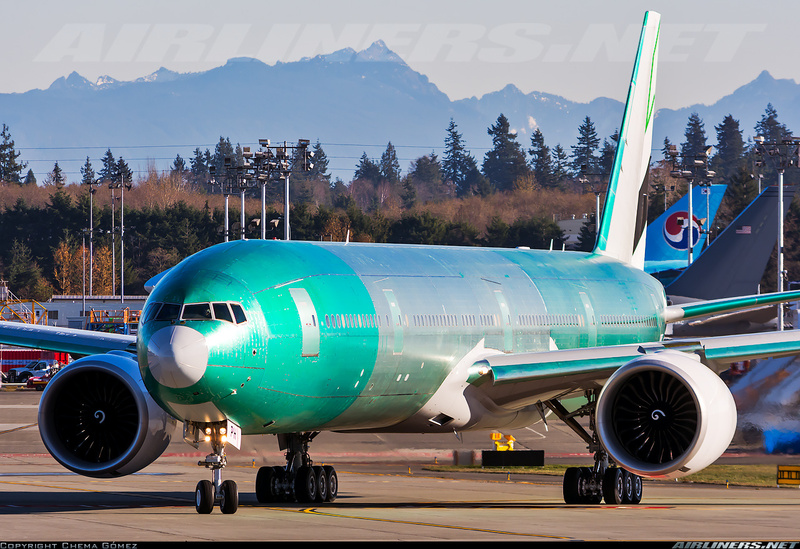 About the Boeing 777-300ER: the price unit of one is around the U.S $315 million (price may have changed) including engines. 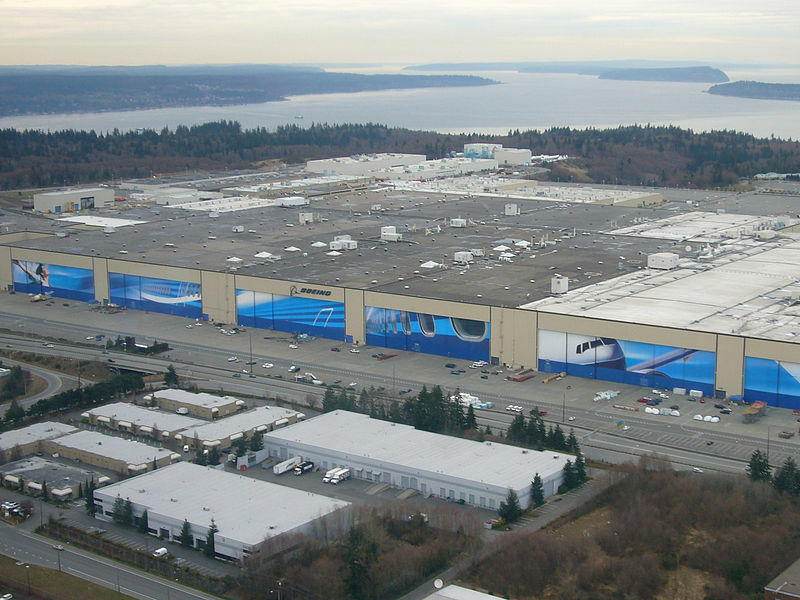 A representative team will head to Seattle for talks with Boeing's team and negotiate the best price for both parties, delivery dates and other discussions related to the aircraft. Once both parties come to an agreement, a contract is signed by both parties and a ceremony may occur. This agreement is usually started off either by LOI (Letter of Intent) or MOU (Memorandum of Understanding) and its possible for the airline to back out of the contract but compensation must be made to the aircraft manufacturer and other relevant parties (engine manufacturers ..etc). After this LOI or MOU is signed, the airline will focus on the interior of the cabin, they can choose to introduce new Business, First and Economy Class products depending on their agenda. Discussions would be made with the seat, toilet, cabin, in-flight Entertainment system, Inflight WiFi and other relevant companies - either by a 3rd party or the aircraft manufacturers' team depending on the airline's needs. 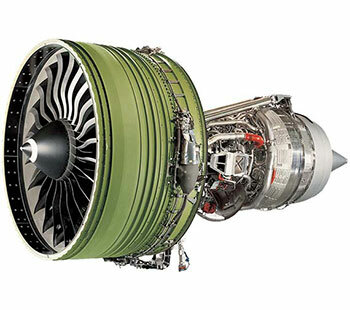 For certain aircraft types, there is a choice of 2 or 3 engine types: Roll Royce, Pratt and Whitney, and General Electric and airlines pick the one that suits them best. For some aircraft types, there isn't a choice. 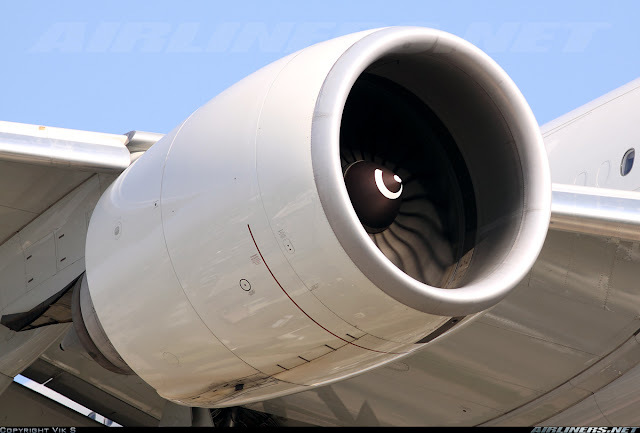 For example Boeing 777-300ER (General Electric GE-90-115B) and Airbus A350XWB (Roll Royce XWB Engines). That is not all, depending on the airline's current fleet, the airline may have to train a selected group of pilots to fly the new aircraft type but usually, the price in the contract includes pilot training). About 6-8 months (usually) before the airline takes delivery of a new aircraft type, the airline would send the selected group of pilots (not all at once) to the aircraft manufacturer for pilot training and familiarisation with the new aircraft type. The most senior pilots in the crew's list are chosen to fly the aircraft home from the manufacturer's base (delivery flight). Once the airline has settled this, a firm order would be placed and contract signed. This usually takes a few months or close to a year depending on the airline. (MOU or LOI to firm order) For LOI or MOU, there is an expiry date. 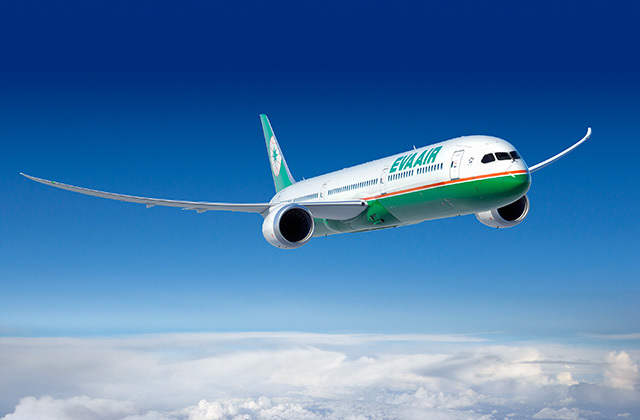 Once the expiry day has passed, the contract is invalid and the airline has to re-negotiate. 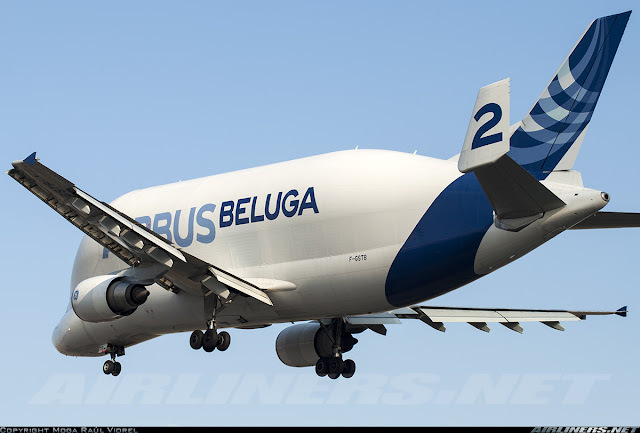 This is Airbus's Beluga aircraft, it is used to carry aircraft parts from one factory to the others. 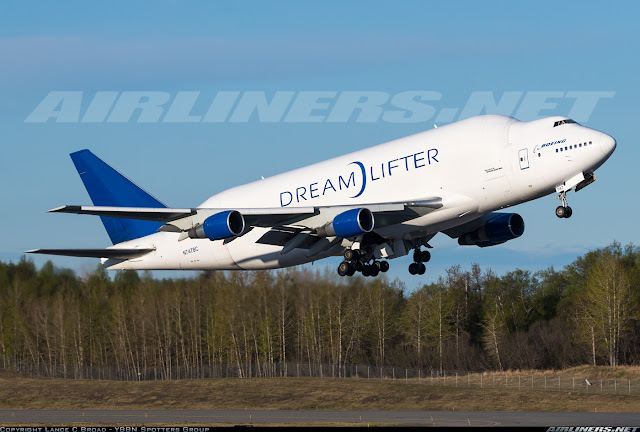 Similar role to Boeing's Dreamlifter, except that it rarely flies out of Europe. Once the airline finishes it's a discussion with the companies dealing with the interior (finalizing the cabin configuration and interior), the delivery date is set and the airline would pay a deposit to all involved then followed by installments. 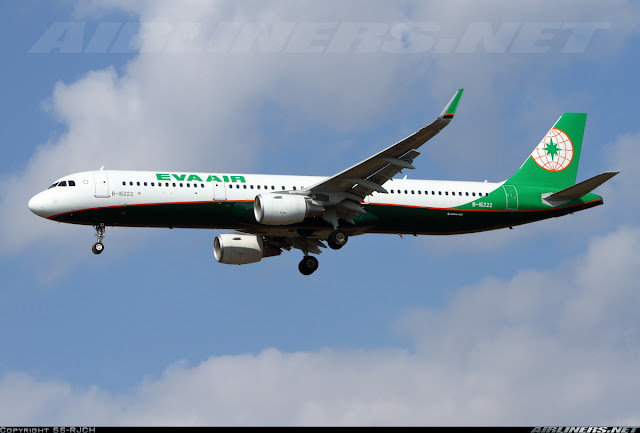 (For purchase) As for the leased aircraft, the leasing company and the airline will discuss among themselves on the financial side (payment). Since the aircraft is leased from the company, the aircraft will, of course, be configured according to the airline's request. This is how new aircraft are being lined up before delivery to the respective airlines. These aircraft are still being tested by the manufacturer. 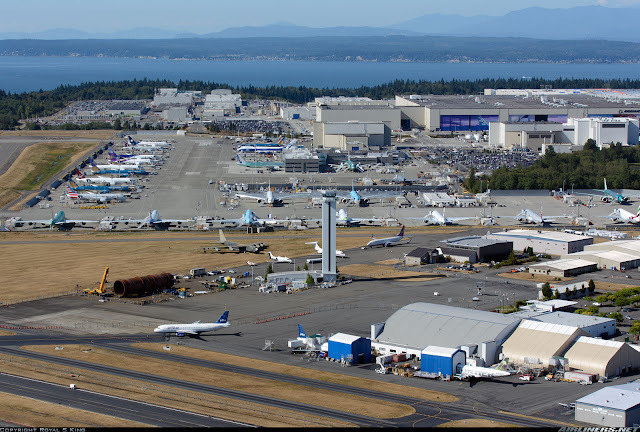 Once it's finished, the airline representatives, ground engineers, and pilots will come here to check the aircraft and run some tests. 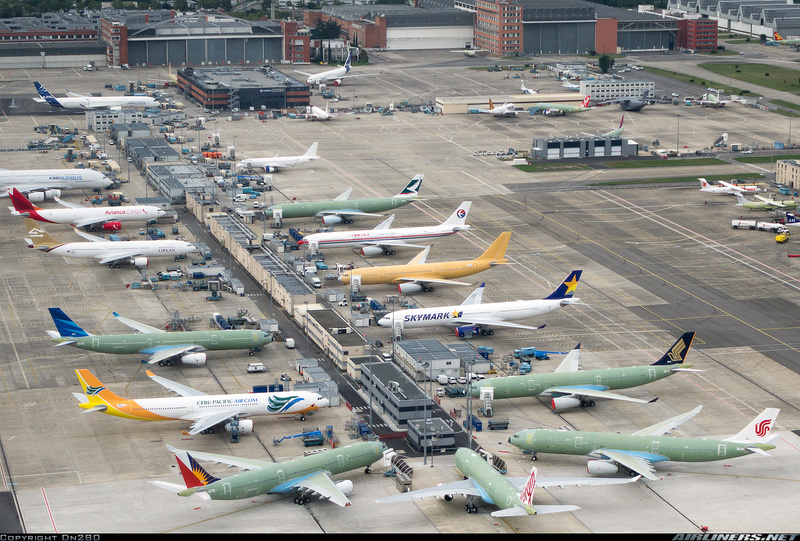 Airbus A330s below including Skymark's A330 which ended up with other carriers. 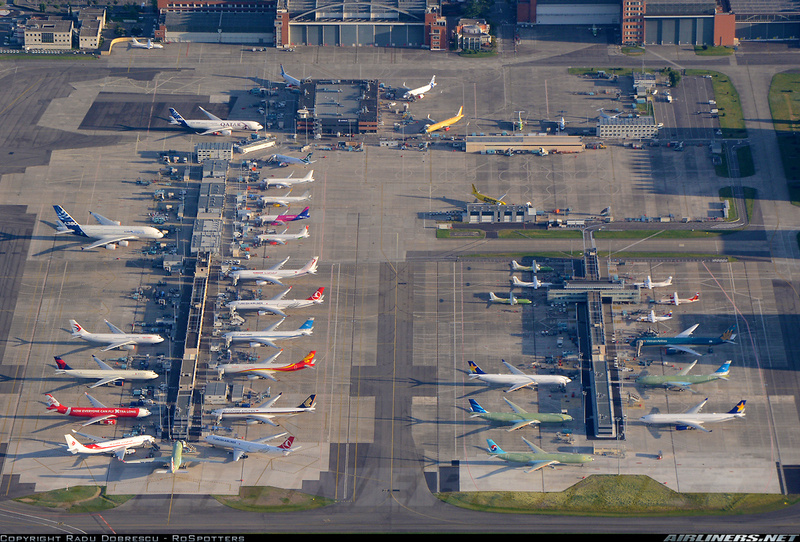 Can you identify the biggest aircraft in the photo below? Hello everyone, I like to share with you my story so please sit back and relax with a cup of coffee or any other beverages of your choice! 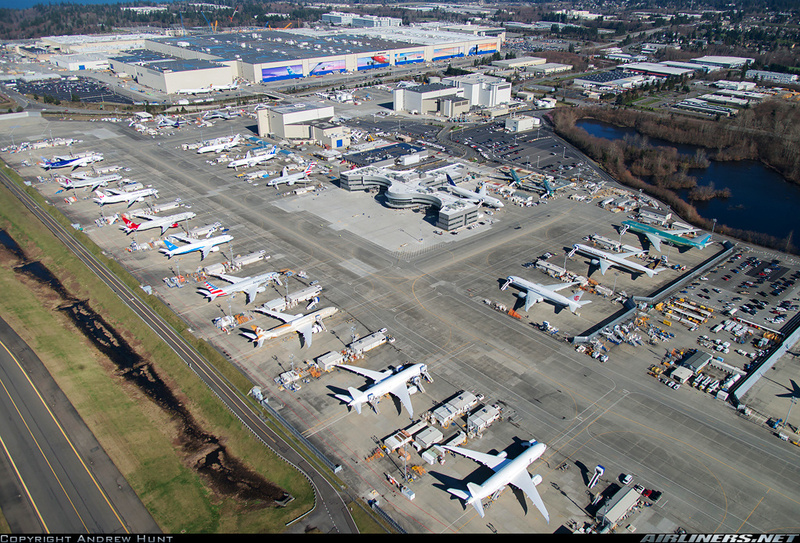 I was born at Seattle, Boeing Field. There was where I got assembled by a group of Boeing staff at the factory. 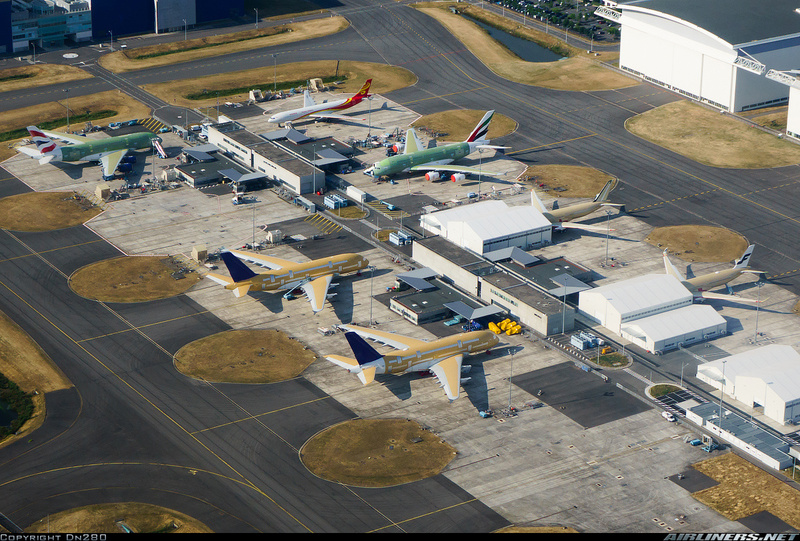 Different parts of me came from different parts of the world and they were all sent to Boeing Everett Plant where it all began. Parts of the fuselage were assembled together with the wings and tail which join my long body (fuselage) not long after, the massive General Electric GE-90-115B engines were installed on the wings. During this time, wires were installed on this aircraft to ensure that every important part of the aircraft is working. Lots of tests have to be done to ensure that the components are properly installed. One of the most numbers of checks done was the landing gears, it's important that they come out during landing, I don't want to land on my belly - it hurts! Once every part was checked, I had to undergo some flight tests before being painted. It was a great feeling to be flying for the first time - I enjoyed every minute of it. Avionics checks would be done to ensure every button in the cockpit is working and some of them require testing during flight test. These are my siblings in Primer Green. 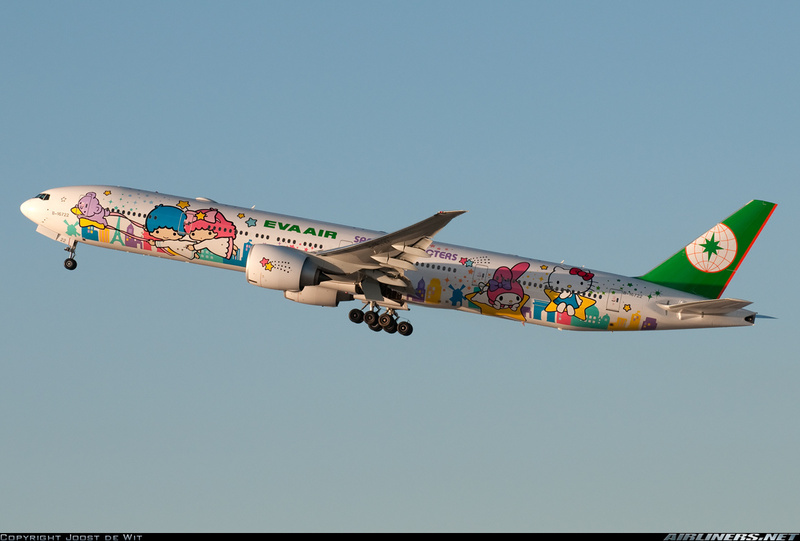 They had to undergo flight testing and once it was satisfied, my siblings were painted in the airline's livery. 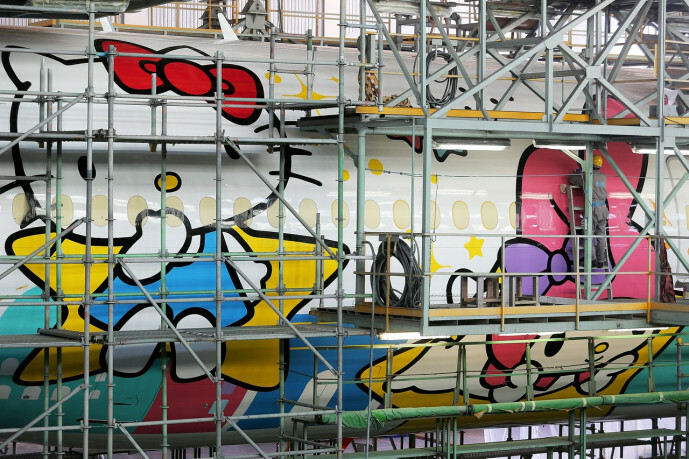 So now you have an idea of how an aircraft looks like without the coat of paint. 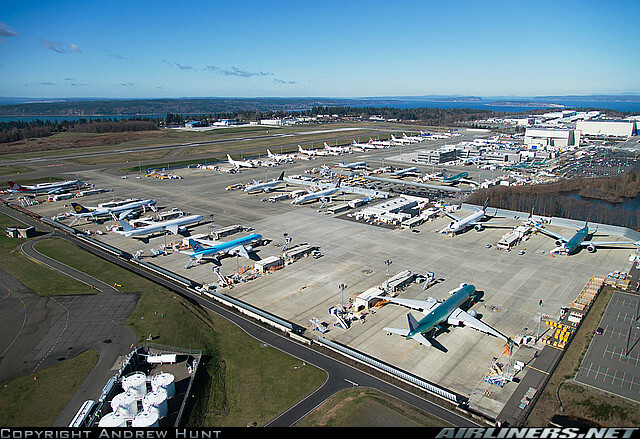 Boeing 747, 767, 777, 787 are assembled at this factory. I remember doing a number of loops. Pilots flying me were making sure that everything was working properly, after all the parts in me has to be durable as I would be doing lots of flying for my airline. 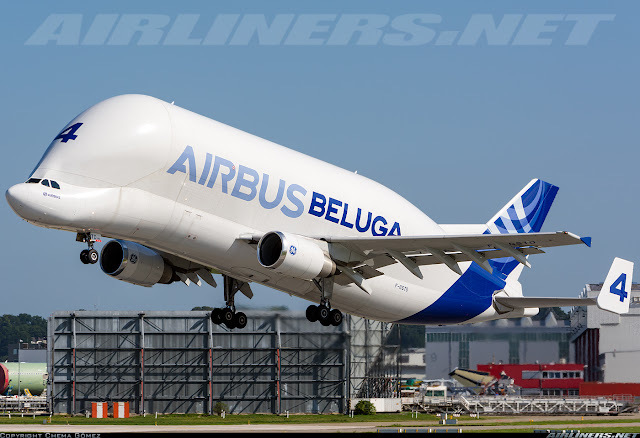 Once the Boeing engineers were satisfied with me, they towed me to the paint shop and I looked like this after it was done. Once the first round of flying tests is done and engineers are satisfied, installment of the cabin takes place: toilets, cabin crew's workspace, Economy Class seats, Business Class Seats, Premium Economy Class seats and crew's rest bunks (for the crew to rest during long haul flights). More tests were done and soon I was ready to head home. It would be sad to leave and I knew I won't be coming back. Before I leave, I said my 'goodbyes' to my cousins and one day, I would meet them either at my home base or in other cities. 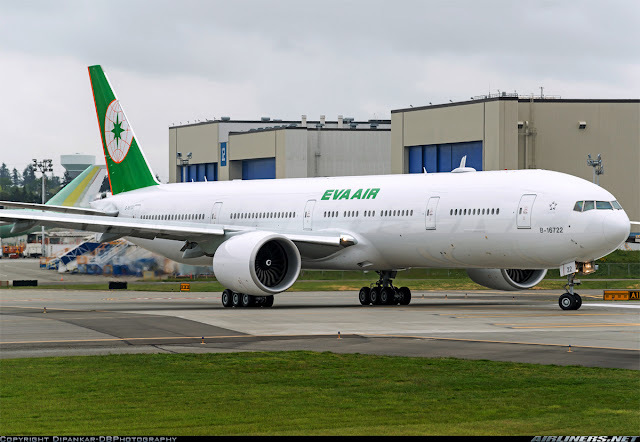 For delivery process, EVA Air will send a few representatives including aircraft engineers and pilots to check the aircraft. It is like buying a car, you have to test it before driving it home, but its more complicated since the size of the aircraft is a lot bigger than a car. The airline's staff would check every part of the aircraft including every seat on the aircraft to make sure they are in working order. Any faulty parts would be changed on the spot, done by Boeing engineers. Every new aircraft has a warranty for a limited period but airlines can either purchase an extended warranty or other arrangements with the manufacturers to ensure the aircraft is in good condition. For airlines operating a new aircraft type or new aircraft in the market, the warranty last longer and the aircraft manufacturers will send their staff to the airlines for a period of time to help the engineers and pilots. 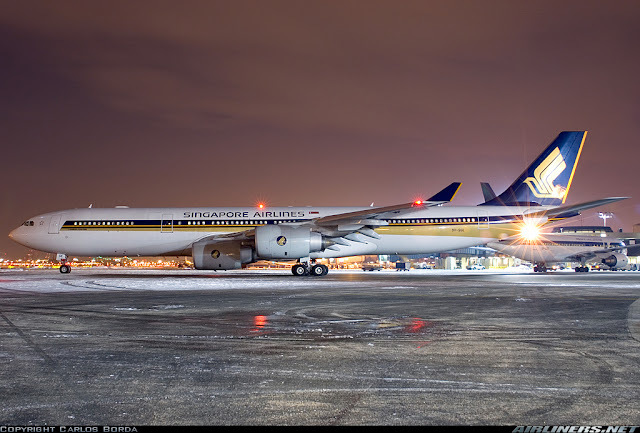 Airlines have to purchase spare parts of the aircraft and the cost of them is usually part of the contract but of course, these parts will run out and the airlines have to order them either from aircraft repair faculties around the world or from the aircraft manufacturers directly. For aircraft maintenance, airlines either do them at their home base or with reputable aircraft engineering facilities in other countries. 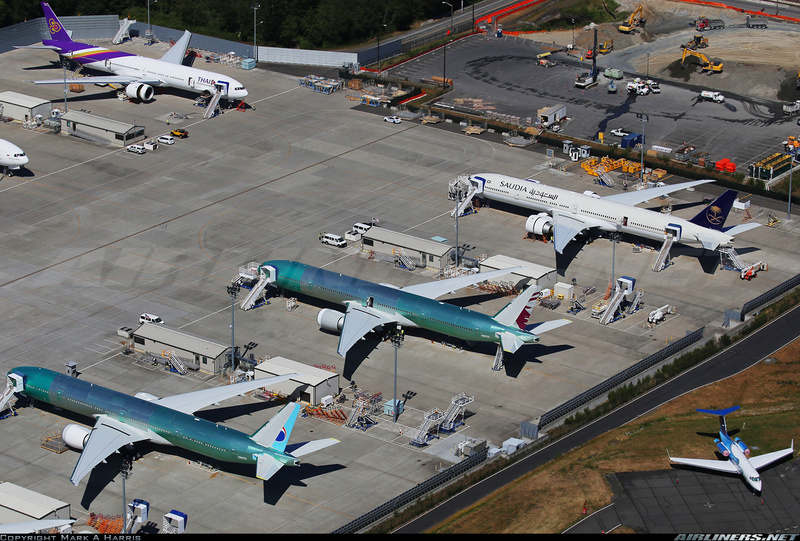 Once the aircraft is ready for delivery, it will be moved to the delivery center and pre-delivery flight checks are done by the Boeing engineers. 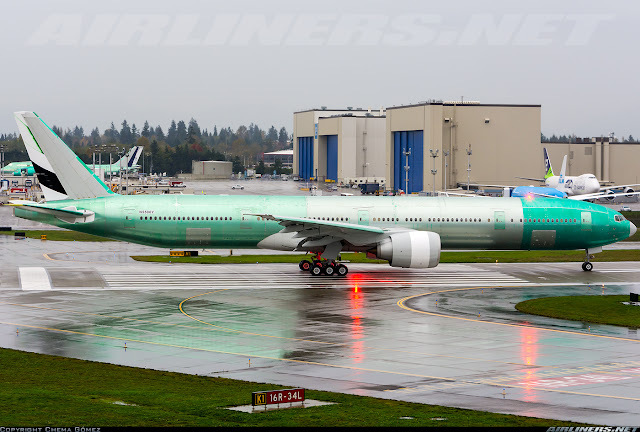 Another round of test flight may be done and more importantly, the aircraft has to obtain the Federal Aviation Administration Certificate of Airworthiness before the airline can take it home. Once Boeing's engineers have completed the checks, it's time for the airline's engineers and pilot to do the checks on the aircraft and customer's test flight would be done. This may take a few days to complete. Once everyone is satisfied, the handing over of the aircraft takes place and after that, the airline's lucky pilots can fly it home. This is me being piloted by my airline's pilots as I was getting ready to depart. 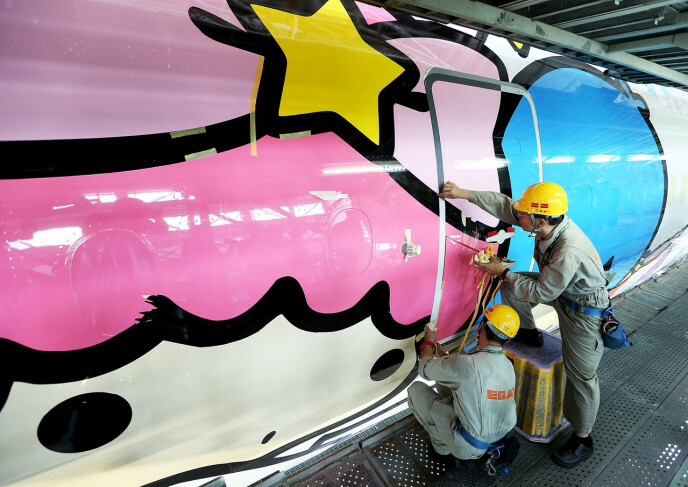 It was only when I reached my home's hanger, I realized I was going to be painted into something colorful. This is me being painted! My first trip to Houston! Photos of me at different locations! At my home base, Taipei Taoyuan Airport! 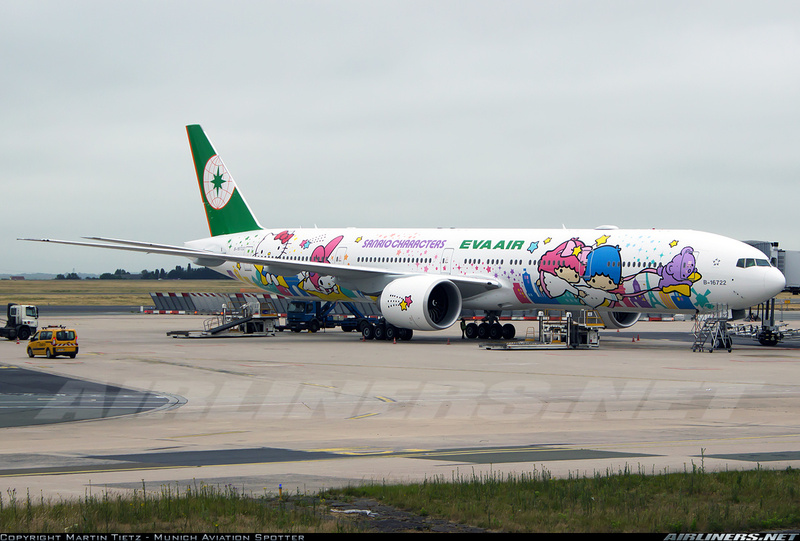 The Hello Kitty painting on the aircraft (All 7 of them) was done at EVA Air's hanger in Taipei Taoyuan. The workers had done a brilliant job and after they finished, I was kept inside the factory for a couple more days before being towed out. A ceremony was done and photos went snapping furiously at me. I love the attention! My older siblings were probably jealous. :) However, they welcome me to the fleet. Soon the airline's staff prepared my cabin for my first commercial flight. The first flight was to Singapore, a few days earlier than expected. This is the management's decision but I was happy about it! It's great to be flying in the skies, and that's where I belong. Registration: B-16722 (20th aircraft in EVA Air's fleet) - B-16704 and B16714 registration numbers are skipped. 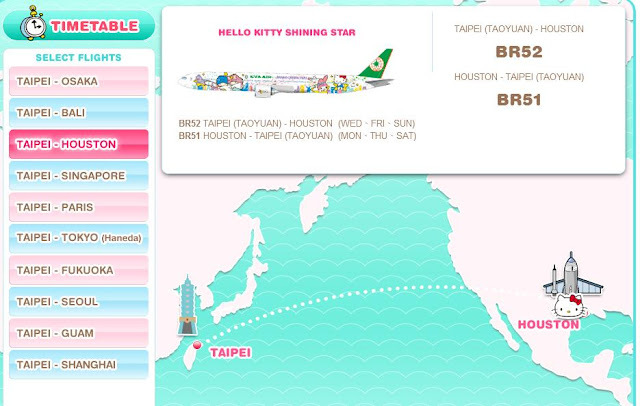 Routes: Most international routes including Houston and Singapore. On the non-Hello Kitty flight days for Houston and Singapore, the schedule planner could schedule me to other destinations (Non-Hello Kitty flights). I am reaching my 1st year of flying soon and I am so happy to have served thousands of happy travelers especially those Hello Kitty fans. Even the aircraft enthusiasts snap a lot of photos of me whenever I am at the airport. My favorite moment? Taking off in front of them, and I hope they enjoy my performance. Thanks for reading. If there are any mistakes, please let me know.